A Reporter's Notebook: Meeting "Lisa's Booby Trap"
It was a few summers ago now, over our morning cup of tea, when she pointed me to a curious little item in the New York Times about an unlikely racehorse with a funny name that - against all odds - was making a big name for itself in that Mecca of racing, Saratoga. And a paragraph in, I was hooked. It was just so...unusual. A small time horse trainer - a curmudgeonly little guy known for his utter lack of sentiment where it came to horseflesh - had used his meager life savings to buy a thoroughbred reject: a lame, club footed, half blind filly so slow her sellers joked that "you could time her with a sundial." And why would he do such a foolish thing? Because the horse reminded him of his dead wife...who promised, on her deathbed, to come back as a horse. A little weird? Well, yes. But the capper was that somehow, up there in Saratoga, this reject had just blown away some of the fastest fillies in the world. Oh, and her name was "Lisa's Booby Trap." What I didn't count on was how emotional it was going to be. 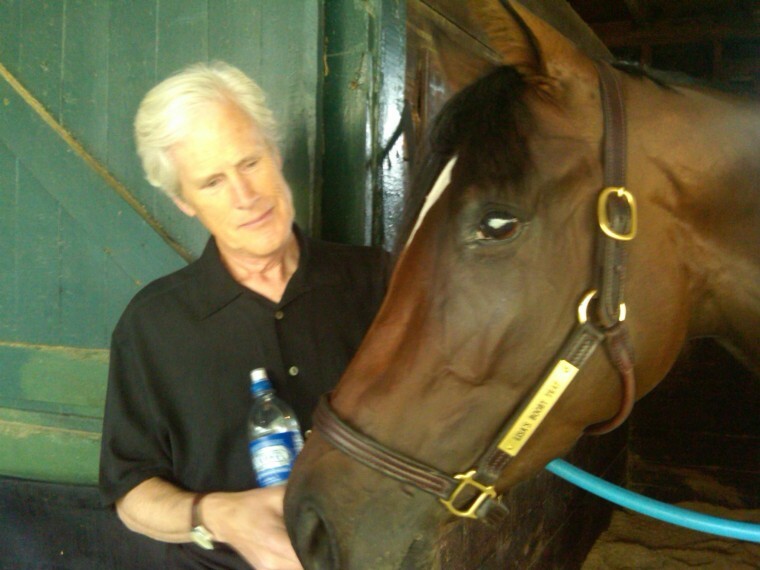 Racing season in Saratoga is steeped in history; you feel it everywhere in the giant old grandstand, on the groomed pathways that look out on both dirt and grass racetracks, and in the thoroughbred stables where, one August morning, I met Lisa's Booby Trap. Perhaps it's because she's blind in one eye (I'm no expert, believe me), but Lisa was the most touchy-feely horse I've ever encountered. Did she wrap her head around my neck because she couldn't quite see me? Don't know, but it was one of those experiences that stays with you. And she's beautiful! Surprisingly tall. Graceful, an equine ballerina. But the most affecting thing was to watch Lisa interact with her owner and rescuer, Tim Snyder. Tim is compact, leathery, gruff, the polar opposite of his lovely horse. She'd start calling for him as his car pulled into the lot outside the stables, crane her long neck out of her stall as he approached, clearly eager to get him close to her. Of course, you don't always find the story you expect when you land on lives in progress. Producer Carol Gable and I were hearing the Saratoga buzz that Lisa's Booby Trap might just be a truly great racehorse. In the upcoming stakes race we set up to record, Lisa was the favorite by a mile. But that didn't turn out to be the story at all. As weeks and months and then years went by, and we dropped in occasionally to visit Tim and his Lisa, we discovered less about racing and more about the power of enduring love. A love that even death could not defeat. You'll see the essence of the odd and affecting story of the racehorse with the funny name tonight. It's a story I'll never forget.